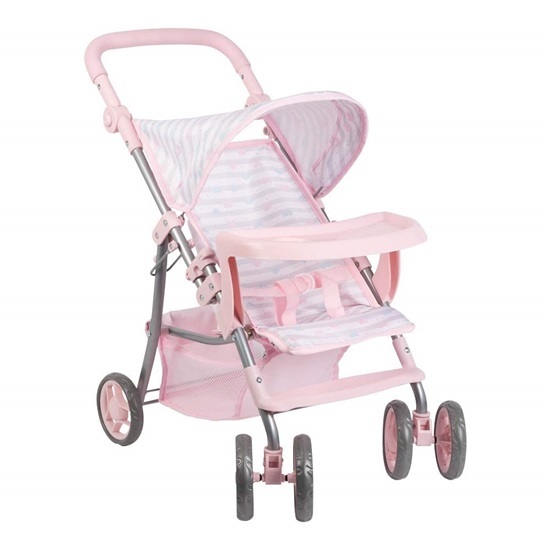 If your little one loves their baby doll toys, then Adora's Pink Snack N Go Shade Stroller is a must-have accessory! It fits all dolls 12”-20” and keeps them snug and secure with a safety seat belt. It includes a padded adjustable handle is designed for your child to grow with. convertible overhead shade, snack tray, plus under stroller storage for the rest of their baby doll accessories. This toy stroller can go anywhere, even outdoors, thanks to the double wheels which make for easier steering and extra stability. Even folds up for easy storage and unfolds when you're ready to go on an adventure!